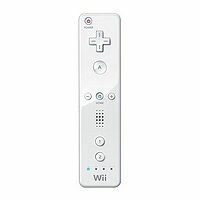 The Wii Remote, also nicknamed "Wiimote", is the primary controller for Nintendo's Wii console. The main features of the Wii Remote are its motion sensing capability, which allows the user to interact with and manipulate items on screen via movement and pointing, and its expandability through the use of attachments. In 2008, an accessory for the Wii Remote was released, the Wii MotionPlus. This gave the Wii Remote slightly enhanced motion control. In 2011, the Wii Remote Plus was released, which featured the accessory installed inside the Remote. The Wii Remote is a controller for Super Smash Bros. Brawl and Super Smash Bros. for Wii U. It can either be turned sideways, like an NES controller, or be playable with the Nunchuk accessory. As an added bonus, whenever one selects a character while using a Wii Remote (or any attachments to it, like the Classic Controller), the character they selected will deliver a line through the Wii Remote's speaker, such as Mario saying, "Here we go!". : Opens up the home menu, where the player can go to the Wii menu or reset Super Smash Bros. Brawl. Can be used similar to pausing, however, one cannot enter the home menu during a pause. Note: Because there is no way to avoid jumping when pressing Up for this control scheme, the only way to use an up tilt with tap jump on is to be holding up while doing some other action. A blue Wii Remote Plus with a label reading "Wii Motion Plus". A Wii Remote connected with a Nunchuk. This page was last edited on October 18, 2015, at 13:57.